Heating, ventilation and cooling off-grid. Goals and ideas. In this article I will get you a short review of off-grid HVAC, or off-grid heating, ventillation and air conditioning. The best energy source for heating is, of course, our sun. It can provide us with heat directly (passively, through large south-facing windows that allow us to get large solar gains), or indirectly, with use of such devices as solar thermal collectors or Trombe walls. In most cool climates, the amoung of solar energy available during winter is insufficient to produce enough heat. If otherwise, you wouldn’t need to heat your home at all and you wouldn’t call the climate cool, right? Even passive houses that utilize this solar energy heavily need some additional auxiliary heat source. The heat from sun and waste heat produced in house (by household appliances, computers, even people and pets) is not enough. 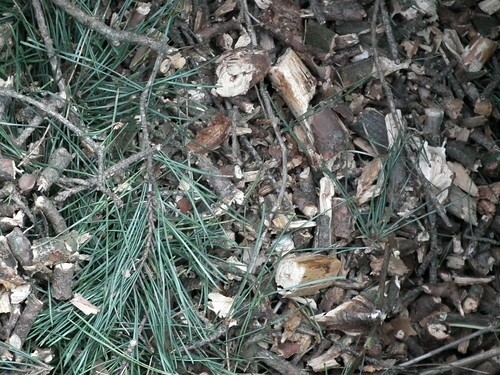 Wood chips made from coppice willow, twigs or brushes, can be used as heating fuel in home furnaces. As I mentioned above, a truly autonomous (off-grid) house would have to produce its own heat independent from energy input from outside. But this would mean that you’re considering an autonomous household, and not an autonomous house. Only in very windy places a wind turbine will produce enough power to heat your home. In most cases you will have to grow your own fuel for home furnace, like coppice willow. additional heat source, like electric heating powered by wind turbine or wood stove fueled with wood chips produced on site. Oh, that’s simple. Natural ventilation is powered by small difference in densities between cold outside air and warm air inside house. So you don’t need any mechanical device for ventilation of house, you just need ventilation stack to remove used, moist air from kitchen and bathrooms, and some holes in windows to allow fresh air to other rooms. You can also have forced ventilation, but that requires some energy to power the fans. But this kind of ventilation allows you to recover some heat from the waste air, and works all year round (while natural ventilation works only when it’s cool or cold outside). It is also required for a building to get passive house certificate.